Pectoral cross - A94 (with chain) - Istok Church Supplies Corp. 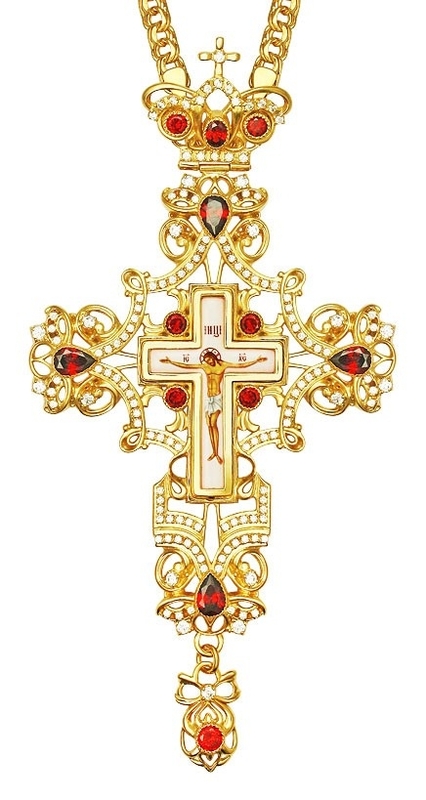 This light ajur pectoral cross of unusual design is made of brass and covered with 24K gold-gilding. The cross is made as a see-through one; on the reverse side the plate covers only the Crucifixion. It is manufactured using a special technology of color image imprinting on a brass base, which is coated with a composition that protects it from mechanical damage and exposure to light. The whole surface of the d?cor is covered with inserts of high quality natural phianite stones, fixed by hand. This ensures that the binding is secure for the entire duration of wearing the cross.